I admit that I know next to nothing about this vehicle, except that it is a re-engined Centaur Mk. III (and everything else that the manual teaches me) and that they were used in the Armoured Reconnaissance Regiments of Armoured Divisions participating in the liberation of France and in all Armoured Regiments of the 7th Armoured Division . I've also been told that the kit represents a "D" hull with split starboard crew member's hatch. Not knowing a lot about this vehicle was actually one of the reasons I chose to build the kit, as it would allow me to build it OOB, and hence actually finish it. At least that was the plan. The construction sequence starts with the rear hull plate. And here I made a terrible mistake, as I misinterpreted the manual. The result can be seen in the pictures below. This is one of the drawbacks of building kits of vehicles you don't know anything about... Luckily I used minimal amounts of glue, so I was able to disassemble the parts with minimal collateral damage, but damage nevertheless. If I built the kit again, I would leave part (2) off until the complete hull was assembled. Then come the wheels. Very nicely done, with pegs for alignment. Cleaning up the sprue attachments on 24 half-wheels takes some time, though. The hull assembles like a breeze, with spaced appliqué armor added to the lower hull (around the suspension) and add-on armor for the nose. (Apparently, this is the way the vehicle was built in real life and the same process has been repeated for the turret.) The lower hull has nice detail, although I can't tell whether it is accurate. Where there are ejector marks they will be perfectly hidden after final assembly. The same goes for parts that at first sight fit less well (see pictures below). I only discovered this after I had filled in the gaps. Well, it didn't hurt, but it was less than useless and time-consuming nevertheless. This is, by the way, a general trend in this kit: it is so well engineered that you don't need to worry about bad fit, seam lines, ejector marks, etc. etc. Revell really thought this over ! The turret goes together very nicely, with the bolted on armor as separate parts. 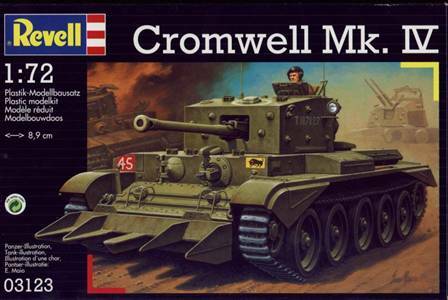 I believe this has allowed Revell to give the turret faces better detail without using slide-mold technology. While the commander's hatch can be opened (after slicing the hatch in two), the other hatches are closed, and no interior is provided. A small and easy improvement that I could not resist was to hollow out the gun barrel's end and to improve the inside of the turret hatch. Well, so far for dogmatic OOB... Then again, I needed to make aerials from sprue, so that would not be OOB either, would it ? Or would it ? Having accepted that the genie was OOB (out of the bottle) I also hollowed out the search light on the left of the turret, painted it silver and filled it in with Kristal Klear after painting the remainder of the kit. In assembly steps 18 and 19 you can fit a hedgerow device and wading hood as an option. Apparently neither were ever used operationally, or so I have been told, so I left them off. (Not that I had much to chose, as my kit was second hand and the hedgerow device was no longer included.) Note that if you go for the hedgerow device you need to leave off the tow shackles in assembly step 7, but I feel that this is not really clearly indicated in the manual. Then again, how good am I at reading the manual ? Next come the tracks. They are very nicely cast, and click into eachother with amazing ease ! The only mistake I made was to cut out the individual links along a line on the inner side that I assumed would be where the sprue stopped... Mistake ! You have to cut about 0.5mm further outward, which I would have noticed had I looked either at the track face or the track sections. Live and learn, and write it down in a review. It's a pity some of the very nice track detail got ruined this way, although I did manage to restore them to full width. The turret can be fitted on top of the hull in a way it can rotate, which is a feature I always appreciate. There is a small amount of play however. The only real error comes with the markings. You get the choice between a vehicle from the 11th AD and one of the 5th Royal Horse Artillery (an observation vehicle), both in the summer of 1944. As Elliott Winthrop pointed out to me, the decal of a white 45 on a red square for the 11th AD vehicle is not correct and is probably an error due to copying the color plates in Jean Restayn's Tanks of WW2 book. The correct color is a white 45 on a green-over-blue square. If I read  thoroughly, then a white 45 on red square was never used for any formation, so you can't even recover the decal for another project. One solution is to obtain a correct decal from a colleague modeler (Elliott in my case) or use decals from sets Skytrex AD38 or AD81 or Peddinghaus EP866 for instance. I combined a decal from Elliott with one of the Peddinghaus sheet for the 45. As my second hand kit came without decals, I have to thank Sean Campbell and Elliott Winthrop for providing a spare decal sheet and separate decals. 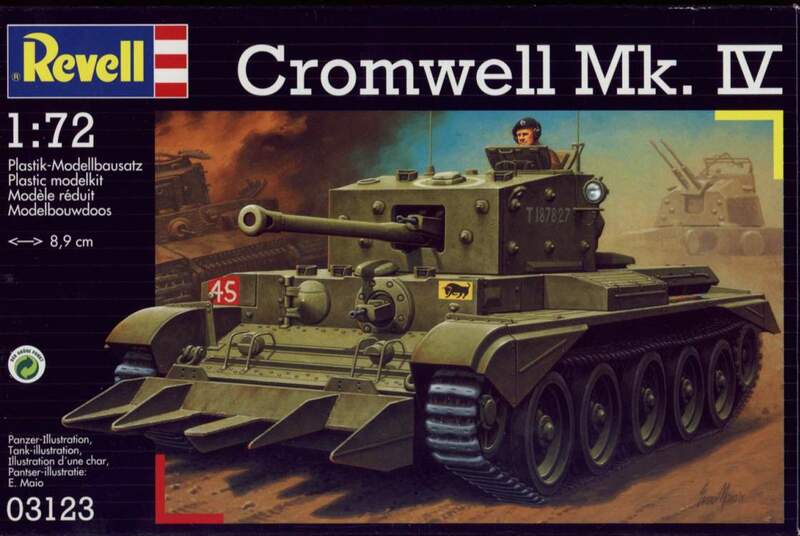 Alternatively, if you'd like to do a vehicle of the 7th AD you can always go for a white 50, 51, 52, 53 or 54 on a red square, as this division was unique in having the Cromwell in the Armoured Brigade as well. A word of caution is needed about the ringed star on the rear of the turret. This is a dubious application of this marking. The turret star is probably correct, but is very difficult to apply without some very convincing setting solution. Incidentally decal 1 is provided 4 times, but is only needed in three positions. The markings of the 7AD observation vehicle seem to be correct, though. There is however a slight misalignment in the red-over-blue square on the sheet I had at hand. The model was painted with ad hoc mixes of Vallejo paints. A black base coat was painted first over which shading with green was applied. I only hope the resulting shade comes close enough to British Olive Drab (SCC15).